This application can register and manageyourbooks. It can divide the books by genres and show thecurrentreading state. The genres are “Literature”, “Non-fiction”,“Business”,“Technology”, “Sports”, “Music”, “Art”, “Picture Book”,“Manga”,and “Others”. The reading states are “not yet get”, “not yet read”,“reading”,“rereading”, “skimmed”, and “finished”. Firstly, please touch the button “ADD” on the top right, andenteryour book info. 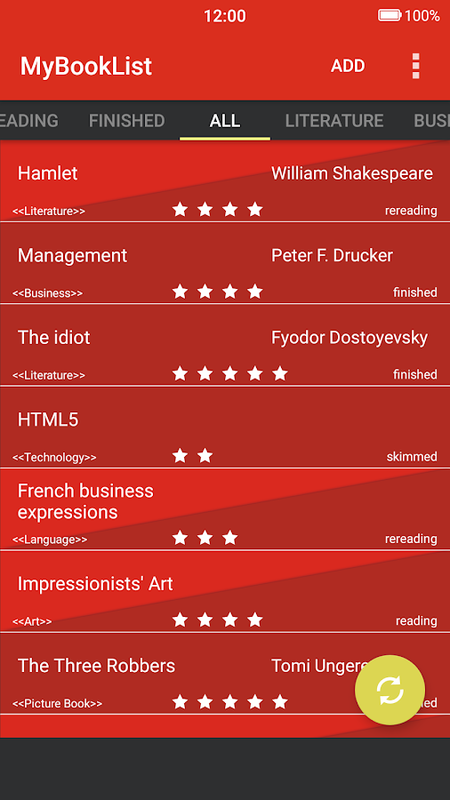 This App show your books in a list. Many people can possibly feel difficult to confirm what numberofbooks, what type of books they have, and the reading state. We would be happy if this application would help you to manageyourbooks. This application can register and manageyourbooks. 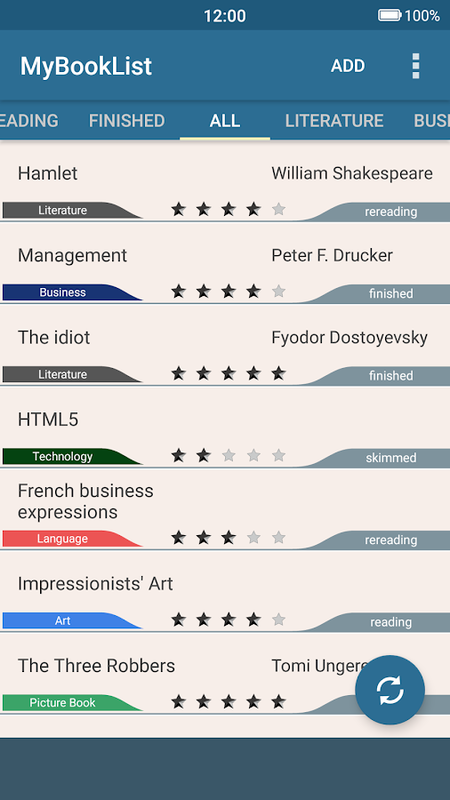 It can divide the books by genres and show thecurrentreading state.The genres are “Literature”, “Non-fiction”,“Business”,“Technology”, “Sports”, “Music”, “Art”, “Picture Book”,“Manga”,and “Others”.The reading states are “not yet get”, “not yet read”,“reading”,“rereading”, “skimmed”, and “finished”.Firstly, please touch the button “ADD” on the top right, andenteryour book info. 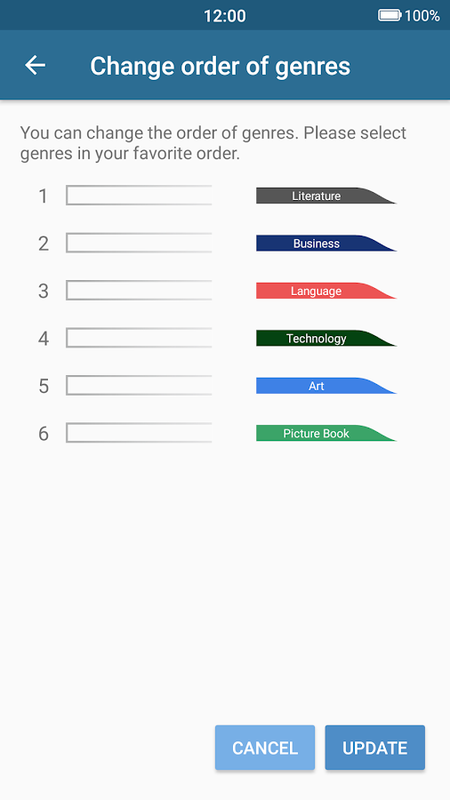 This App show your books in a list.Many people can possibly feel difficult to confirm what numberofbooks, what type of books they have, and the reading state.We would be happy if this application would help you to manageyourbooks. This is a simple check list for organize your life. We are pursuingauthentic simplicity and comfortable control. Features: - Rearrangethe order with drag and drop - Delete with drag and drop - Voiceinput - Home screen widget No ads. No frills. No confusing details.Does not require any permission. Does not require an account. Forshopping list, todo list, task list, memo, reminder, etc... It's upto you. SoftList offers an extensive set of features with a modern andintuitive visual. Speed ​​and convenience. Create your shoppinglist quickly using our product catalog and with the help of theautocomplete resource. Simple and complete. You can create lists byjust adding the names of the products or complete lists by addingprice, unit of measure, category, observation and photo. Followyour purchase. Add the price of the products and let SoftListcalculate the total purchase for you. Purchase history By savingthe history of your purchases, you can perform an analysis of yourexpenses, and if you have purchased the same product in differentstores, perform price comparisons. Control your expenses. SoftListis the only shopping list app that has reports and charts toanalyze your expenses. You can analyze various information, such aswhich product or category had more expenses. Just save the historyof your purchases and generate reports. Cloud services. With cloudservices you can synchronize your data between multiple devices,share lists with others and keep all your data saved in the cloudthrough automatic backups. To use the cloud services you need tocreate a SoftList account. You can create this account at any time,even after creating your lists. Features: - Register and manageyour shopping lists. - Catalog of products with images. - Registeritems manually, using voice command or by scanning the barcode. -Add images to the products. - Products arranged by categories. -Possibility to define the order in which categories will bedisplayed. - Share your shopping list by email, SMS or WhatsApp. -Copy and move items between lists. - Add price to the products andsee the total purchase. - Save your purchase history. - Reports formonitoring expenses. - Reports to compare prices. - Share listswith others. - Automatic backups using cloud services. -Synchronize your data between multiple devices. SoftList is nowavaliable on Android Wear smartwatches. With Treehouse Table, meal time is easier,your family is happier, and everyone is eating better. In one appyou get: customized weekly meal plans, shared grocery lists withsale suggestions, a digital recipe box, and pivot plans forlast-minute places to eat out. And you get every feature from mealplanner to shopping list free. No gimmicks or catches. We’velistened to lots of families and used their input to offersolutions to some of the biggest meal time frustrations. We trulybelieve we’ve built the best solution for meal planning out there,and we think you’ll feel the same way when you try it.Simply complete your family’s personalized profile and we willauto-magically create custom tasty weekly meal plans with healthy,top-rated recipes that reflect your tastes and needs. Then checkyour shopping list where we transfer the ingredients you’ll needand tell you what’s on sale. Whether you’re making dinner for twoor for an entire little league team, Treehouse Table has youcovered.Why you’ll love your Treehouse Table App:CUSTOMIZED MEAL PLANNER – Dinner the whole family will love!• Get automatic weekly meal plans based on your family’s needs andnever plan a menu again!• Set personal like amount of time to cook, your family’s likes anddislikes, food allergies, and how much you want to spend to createcustom menus: vegetarian meal plans, healthy meal plans, whateveryou want!• See your delicious personalized meal plan your whole family withlove• Meal plans are always customizable: add anything you like, switchmeal days, or request new suggestionsSALE SMART SHOPPING – Stretch your dollar further!• We work in the background to find grocery sales at your favoritestore• Your meal plan takes advantage of on-sale items to maximize yourbudget• Easily see what’s on sale with items tagged on your grocery storelistGROCERY LIST PLANNER – Make shopping simpler!• Items from your meal plan are auto-magically added to yourshopping list and organized by aisle or by recipe• Repeated ingredients from multiple recipes are combined to makethe list perfect• Additional items can easily be added to your list, and items thatare purchased frequently are saved for quick adds whenever youlike• Adding and editing items updates in real-time, making it easy toshare the loadDIGITAL RECIPE BOX – Save what you love and add your own!• Search through thousands of top-rated recipes by category andeasily add them to your meal plan or favorite them for later• Have a favorite recipe of your own? Perfect. We’ve built an easyway to add it to your recipe boxRECIPES – Stay inspired and easily adjust to fit your family!• Our top-rated recipes have easy to follow step-by-stepinstructions and nutritional information• Have more people coming over for dinner or want to have leftoversfor tomorrow’s lunch? Just change the number of servings and ourrecipes scale smartly so that you’ll always have the right amountof ingredients on handPIVOT PLAN - Even when you don’t want to cook – We’ve gotyou!• Not wanting to make dinner at home tonight? Quickly search for arestaurant in your neighborhoodPLUS…• Your Treehouse Table account is accessible for all your familyright on an Android or iOS phone• Also, check out our free companion app, Treehouse, which lets youseamlessly link family organization (to-dos, shared calendars,messaging and photo sharing) to everything you have stored in yourTreehouse TableContact UsQuestions for us? Suggestions on how to make our app better? Lovenotes? We love hearing from you!Learn more about the most complete family management app:www.thetreehouseapp.comHave a support question? Email us at:[email protected] us on Facebook:https://www.facebook.com/thetreehouseapplication/Follow us:https://twitter.com/team_treehousehttps://www.instagram.com/thetreehouse_app/And if you’re enjoying your Treehouse Table App let us know byleaving a review here.